People with Pathological Demand Avoidance or PDA are driven to avoid demands due to their high anxiety levels when they feel that they are not in control. In individuals with PDA, their avoidance is clinically-significant in its extent and extreme nature. Children and adults with PDA can also mask their difficulties, and their behaviour can vary between settings. PDA is a relatively new diagnosis it is frequently confused with Oppositional Defiant Disorder (ODD) as a diagnosis. 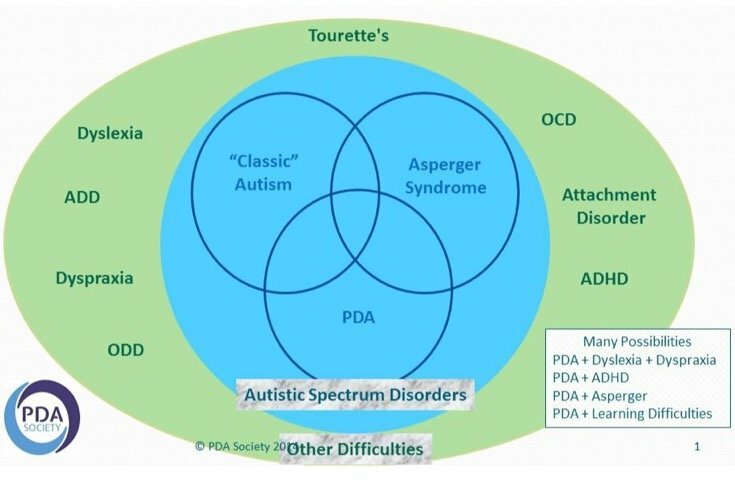 PDA as shown in the diagram below from the PDA Society (www.pdasociety.org.uk) PDA falls within the circle of Autistic Spectrum Disorders, whereas ODD does not. There other conditions with frequently cooccur with autism in the green circle. Please note that Asperger Syndrome is now referred to as High Functioning Autism (HFA), although there is still some dispute that they are separate conditions. There is overlap between most of these diagnoses. The term 'can't help won't' is often used to describe PDA. Consequently, if the condition does not appear in the leading diagnostic manuals for psychological conditions some schools and educational institutions may find it difficult to provide support. Many argue that every individual with PDA is autistic. Atypical autism with demand avoidant tendencies. Obsessive’ behaviour that is often focused on other people, which can make relationships very tricky. Direct demands tend to increase anxiety levels, which lead to overload in the individual. The deficient behaviour is a strategy for the individual to try to manage the anxiety caused by the demands. Many of these demands may be quite modest to individuals without PDA. One should not lose sight of the fact that individuals with PDA can be quite positive and have many strengths. They can interact well socially and can be quite talkative. They are said to have charm and can be warm and affectionate. Their need to take control means that they are often seen as quite determined. They can have a rich imagination and are frequently described as creative and passionate. Always make sure that your day activities are flexible, the the individual with PDA child might not want to do them in a particular order they might want to do it in a completely different order. Allow that flexibility and you will find that the individual with PDA will be able to cope with the anxieties of the day a lot easier. People with PDA need to feel so they are in control like autism, and other ASDs anxiety rules the day for them if they do not feel in control of a situation the sense of anxiety rises and then they feel panicky and fearsome of what is going to happen; particularly when it comes to change for PDA individual the fear of not being in control generates a resistance to what if the change or a request you might want them to do something they might not be able to do or not want to do it because they might get it wrong. PDA individuals often see the worst in every situation they will always think of the worst thing that could possibly happen; reassure the PDA individual that there is nothing to worry about - do not be confrontational. 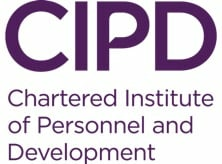 A lot of PDA individuals have a problem with self-esteem and confidence they think that if they do whatever it is they are being asked to do they are not going to do it properly; it might be that they feel they will be laughed at. They might feel embarrassed. There is a huge amount of anxiety that is behind these inner fears the best thing to do is boost up PDA individual’s confidence tell them exactly what they get right, tell them what they are good at. Help the person with PDA see that the change out is beneficial to them, and not to you. The key here is to make them feel that they are making the decision themselves, make them think that actually the decision is their decision. Always make the outcome look beneficial to them and not to you. We know that people with PDA love to be in control of their own world given the responsibility to do something to help themselves this will make them feel as though they are completely in control of their being and their body and, therefore, the outcome. 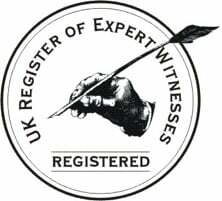 The secret to it is careful wording in the request do not bark an order at them but suggest a way of doing something and add the element of responsibility into that request so they feel as though they are doing something for themselves. People with PDA need to know there will be a beginning a middle and an end. Help them to think what it will be like to achieve the end result. Provide them with a sense of responsibility.